Is Pandora a Buyout Candidate for Tech Giants Like Apple and Amazon? As rumors of a potential Pandora buyout surface, can the scrappy upstart survive as the world’s tech elite turn their eyes increasingly toward radio? 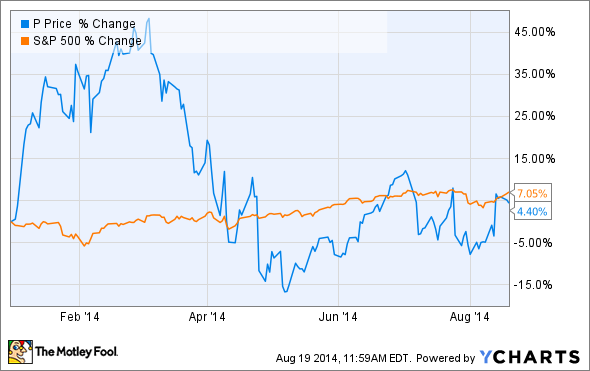 This has been an up-and-down year for Pandora Media (NYSE:P), to say the least. Although share prices of emerging high-growth companies such as Pandora tend to spike and drop more than their established counterparts, the music streamer's stock in 2014 has been a positive maelstrom of peaks and valleys. Pandora recently enjoyed yet another one of its seemingly daily surges on news that the online radio pioneer could be a buyout candidate for a cash-rich tech giant such as Apple or Amazon.com. This comes as many of the biggest names in the industry have increasingly demonstrated an interest in streaming music. In the face of these rumors, interested investors and observers would be fair to question whether Pandora can live up to its much-ballyhooed place as radio's digital disruptor, or will an Apple or Amazon of the world simply either destroy or acquire Pandora as it struggles to develop a sustainable long-term business model? Pandora: Sustainable success or sucker's bet? Nailing down Pandora's exact moneymaking potential has always proven notoriously nebulous, in no small part because the company's financial drivers are still evolving in real time. At a high level, Pandora's business model is quite simple: It pays royalties to various music industry bodies when users listen to a given song. Pandora then collects money from advertisements and subscriptions to its online radio service. The royalties side of Pandora's business are fixed and break down as follows. In its most recently reported quarter, Pandora's ad-supported product produced 80% of its revenue, versus 20% for subscriptions, although the subscription business grew about 50% faster than its ad-supported model. Either way, it's an absolute given that Pandora's royalty costs will rise in years ahead. The question then becomes, can Pandora's revenue rise fast enough to offset that expense, or more ideally, produce reliable profits? And that's where the situation becomes more ambiguous. Pandora has invested heavily on developing its ad-sales capabilities in an attempt to diversify away from less lucrative advertisements such as blanket national campaigns from major brands into more profitable advertising segments like local advertising. One of Pandora's key advertising metrics is cost per mille, or CPM, which simply measures how much money Pandora makes per 1,000 ads served (more background here). According to Pandora CFO Mike Herring, Pandora yields a CPM of $4-$6 on national campaigns from major brands, while local ads (think a car dealership targeting people within a 5-mile radius) generate CPMs of $9-$12, or even more in some cases. Pandora has expanded its local ad-sales presence into 37 of the top 50 markets in the U.S. However, even then it's challenging to gauge Pandora's ad-mix breakdown and the exact extent to which the company can tap into these higher-CPM advertising markets. Pandora estimates that about 74% of all radio advertising is local in nature, so it appears there's ample room for expansion into this more lucrative segment. But when it comes to projecting financial performance, it's simply too hard to make reliable estimates about Pandora's future performance. Although I'm not confident in projecting the company's future financial performance, I'd be shocked to see a company such as Apple, Amazon, Microsoft, or Google purchase Pandora. For starters, most established tech names that might have an interest in streaming music already have some kind of offering in the works. While several of those offerings might not be as robust as Pandora, it strikes me as distinctly unlikely that any major technology company would pay the $5 billion or more it would take to swallow the likes of this company, especially after accounting for Pandora's still-evolving economics. So if Pandora isn't likely to be purchased by a deep-pocketed competitor, then it will obviously need to stand on its own two feet, financially speaking. As seen above, it's difficult to project whether Pandora's business model will ultimately prove scalable. The streaming radio upstart has made significant strides in bolstering its ad rates in recent years, and will likely continue to do so to some degree. However, with monthly active listener growth slowing to a trickle as the overall market for streaming music becomes more saturated, I remain skeptical of Pandora's generous valuation (7 times EV/sales for those of you scoring at home). So rather than advise those watching Pandora to stay away from it, as either consumers or investors, I'll advise caution, which hopefully by now you agree is justified. It's simply too tough call today.